FURNACE TUBE DECOKING BY PIG | PIG METHOD | UNIPEC Co.,Ltd. The furnace tube decoking pig has become the main means of removing deposits from furnace tubing. This more advanced cleaning method was born from traditional cleaning methods like chemical cleaning and combustion methods. Here is how they work. A pig has pins uniformly studded around the its surface. When these pins come in contact with the inside wall of a pipe they scrape carbons and other contaminants off of the pipe surface and this all can be done at ordinary temperatures. As a result cleaning or decoking as it's called can be done without causing harmful thermal fatigue and corrosion which happens with chemical cleaning and combustion methods. However pipe conditions vary greatly. Carbon and iron sulfide percentages found in the pipe vary as well as pipe thickness. 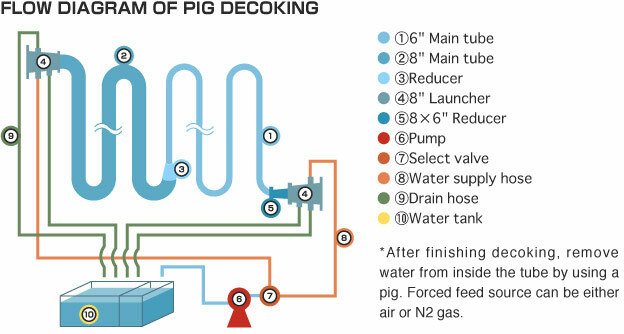 This is why it is necessary to examine the scale or deposit thickness by using gamma rays before performing the pig decoking process. All of these variable impact how many pigs are used and the frequency of pass through.